Model and Molecule. An Overview of Protein Crystallography. Protein Crystals. Collecting Diffraction Data. From Diffraction Data to Electron Density. Obtaining Phases. Obtaining and Judging the Molecular Model. A User's Guide to Crystallographic Models. Tools for Studying Proteins. Subject Index. Crystallography Made Crystal Clear is designed to meet the need for an X-ray analysis that is between brief textbook sections and complete treatments. 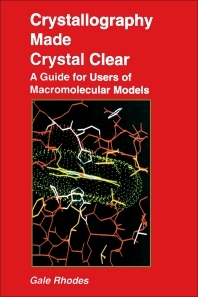 The book provides non-crystallographers with an intellectually satisfying explanation of the principles of how protein models are gleaned from X-ray analysis. The understanding of these concepts will foster wise use of the models, including the recognition of the strengths and weaknesses of pictures or computer graphics. Since proteins comprise the majority of the mass of macromolecules in cells and carry out biologically important tasks, the book will be of interest to biologists. Provides accessible descriptions of principles of x-ray crystallography, built on simple foundations for anyone with a basic science background Leads the reader through clear, thorough, unintimidating explanations of the mathematics behind crystallography Explains how to read crystallography papers in research journals If you use computer-generated models of proteins or nucleic acids for: Studying molecular interactions Designing ligands, inhibitors, or drugs Engineering new protein functions Interpreting chemical, kinetic, thermodynamic, or spectroscopic data Studying protein folding Teaching macromolecule structure,and if you want to read new structure papers intelligently; become a wiser user of macromolecular models; and want to introduce undergraduates to the important subject of x-ray crystallography, then this book is for you. Biochemists, chemists, and biologists involved in research in protein structure and function, including researchers in molecular biology, cell biology, endocrinology, neurology, enzymology, protein chemistry, genetics, pharmacology, evolutionary biology, immunology, microbiology, plant molecular biology, and other biological disciplines. Researchers in the biotech and pharmaceutical industries who design and synthesize drugs and other molecules will find this book useful, as will graduate students in biochemistry and biophysics. Gale Rhodes earned a B.S. in applied mathematics at North Carolina State University, and then a Ph.D. in Chemistry at the University of North Carolina. He is currently a professor of chemistry at the University of Southern Maine, Portland. His main duty, and first love, is teaching undergraduate biochemistry. He has received awards for outstanding teaching at three different colleges. His best known publication is the first edition of Crystallography Made Crystal Clear, which received very complimentary reviews in several journals. He has also published three book chapters, three book reviews, and about 30 articles on diverse subjects, including research articles in biochemistry, and articles on chemistry, science, and interdisciplinary education. University of Southern Maine, Department of Chemistry, Portland, U.S.A.